Though today it is one of the biggest banks in Russia, Sovcombank started out from humble beginnings. Under the name Buoykombank, the bank was incorporated in November 1990 in the small town of Buoy, which can be found in the northern region of Kostroma. For over a decade, it performed well as a local bank, servicing the financial needs of the people of Buoy. But this institution was soon to extend much further than the borders of Kostroma: a new chapter in the bank’s history began when two brothers, Sergey and Dmitry Khotimskiy, together with their business partner Mikhail Klyukin, bought Buoykombank outright. “We bought Buoykombank in 2001 and every one of us thought that it was a temporary project,” said Sergey Khotimskiy, co-founder and First Deputy CEO of the bank. “We wanted to buy a small regional bank for $300,000, get a foreign exchange licence, transfer it to Moscow, and then sell the bank for $1m – that was the business plan. But for some reason, we still haven’t sold it. We really like banking and don’t want to do anything else.” Instead, with 100 percent of the bank’s shares in tow, the trio embarked on a complete transformation. This began with a new name – Sovcombank – in 2003. During Sovcombank’s early years, it operated under a traditional banking model, with a particular focus on retail banking for pensioners – a niche area in Russia’s financial services sector that most banks shied away from at the time. Banks shared a reluctance to lend to pensioners because of their generally low incomes, as well as their shorter life expectancy compared with those of their counterparts in developed economies. In Russia, the average life expectancy is 71.9 years – below the global average of 72 and a far cry from those of developed economies, with the US, Germany and the UK boasting expectancies of 78.5, 81 and 81.4 years respectively, according to the World Health Organisation. This fact, together with the specific staff training and expertise needed to serve pension clients, held most traditional banks back. Sovcombank, however, embraced the challenge. Thanks in large part to its prudent financial behaviour, the bank was able to turn this niche sub-sector into an opportunity for growth – one that few others in the market had recognised. Though the loans were small and often made on a short-term basis, the cost of risk was among the lowest the market had to offer (see Fig 1). This was key, particularly as interest rates were at the same level as in other, riskier areas. With Sovcombank’s cost of risk being among the lowest in the country, its expansion soon took place: starting life as a single office in Buoy, today the bank’s retail segment has over 2,000 offices in more than 1,000 towns across Russia, serving some 3.2 million customers. This widespread presence was helped by a series of strategic acquisitions over the past 10 years, which have seen the bank become one of the most successful in the market. Between 2014 and 2017, Sovcombank achieved an average reported ROE of 50 percent (see Fig 2), making it the most profitable banking group in Central and Eastern Europe in both 2016 and 2017. However, as Gusev explained, many banks were not completely capitalised during that period, meaning they did not have a capital base in place to fully support growth. Sovcombank, on the other hand, maintained a prudent approach and expanded with the pace of its new profit generating capacity. It is through this strategy that Sovcombank has since established itself as one of the biggest privately owned banks in Russia. While the bank has evolved in numerous ways since 2003, one core aspect of its operations continues: pensioners and pre-pensioners remain one of Sovcombank’s main clientele. That said, the bank is also in the process of diversifying its clients significantly with a new line of products, which includes installment cards, home equity loans, mortgages and automobile loans that are aimed at younger customers. Over the past five years, Sovcombank has led 10 successful M&A deals, which in turn has enabled it to increase its capital base considerably. What makes this achievement all the more noteworthy is that most M&A transactions in Russia during this time have been unsuccessful. Indeed, this is a trend that can be seen all around the world – simply, M&A successes have not been favourable to acquirers for some time now. “Despite global trends, we have been successful in each and every one of our M&A transactions,” said Gusev. He puts this success rate down to three key pillars: “First of all, who you are buying from is very important. Every seller that we deal with is a very reputable organisation – either foreign, such as a big foreign bank, or a very successful privately owned Russian group. Dealing with the purest, cleanest banks gives us valuable expertise in the most attractive niches. The bank’s record reflects this: its longest M&A integration process took nine months, while the fastest was concluded in just four. Gusev said: “This short period of time ensures that the transaction does not lead to what I call the ‘disorganisation of the acquirer and the target’. I believe that if you spend too much time walking in parallel structures, then most of the competitive advantages that you plan to utilise after the acquisition end up being wiped out.” This strategy has worked superbly well for Sovcombank, not only at a time in which M&A activity has been low, but also during a period of relative economic hardship for Russia. The 2008 financial crisis rocked the world and had a huge impact on the Russian economy. The effect of this external shock was exacerbated further by the bursting of Russia’s asset bubble and a collapse in oil prices, which led to considerable capital withdrawals from the country. Describing the atmosphere at the time, Sergey Khotimskiy said: “Initially – in the segment of private banks, and to a lesser extent the state-owned banks – bankers didn’t really value a bank’s capital. When a bank invests in assets that can’t be sold today, it automatically means that for some reason the bank either does not protect its capital or does not plan to give the money back quickly. And it was with this ‘birth trauma’ that many Russian private banks began their journey. 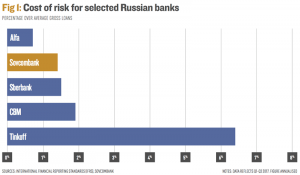 This scenario marked the first significant purge of Russia’s banking system. But while the external shock of the 2008 crisis had an irrefutable effect, the country was better positioned fiscally than it had been in the past, taking lessons learnt from the 1998 Asian financial crisis, which had dire consequences – including a default on domestic debt. But just as economic recovery began to sink in, Russia was hit with another crisis in 2014. It started with an enormous – almost 50 percent – plunge in the price of oil. Being heavily dependent on the oil sector, the government was forced to make swift and significant budget cuts. It did so primarily through public sector salaries, all the while providing support to the companies affected by taking assets from the National Welfare Fund. Then came another blow: economic sanctions were imposed by the US and Europe in a bid to curb Russia’s energy future. By curtailing access to western technology at a time when Russia was planning to tap new deep-sea, shale and Arctic reserves, the US and Europe took aim at the very foundation of Russia’s economy. Unsurprisingly, sanctions were followed by a collapse of the ruble, which had a sudden and devastating effect on the economy. Amid the crisis, Sovcombank had to work quickly and decisively. “The supervisory board of Sovcombank met on December 29 and reviewed the 30 largest issuers in order to set limits on them. From January 2, 2015, the entire team in Sovcombank’s treasury unit worked from morning until late in the night, buying paper at the bottom. Between January 2 and 10, Sovcombank bought bonds for $500m; by the end of January, due to the growth of securities in the price of this strategy, the bank achieved a profit of $50m. We were not the only ones who worked on those days, but there were almost no banks that managed to raise their limits and ensure the work of the treasury unit 24/7,” said Khotimskiy. In fact, the bank was able to utilise a variety of opportunities that it recognised during both the 2008 crash and the Russian economic crisis of 2014. “During these periods of time, we managed to buy very attractive assets and secure very attractive clients. So we actually made more money and were more successful after those crises than ever before,” Khotimskiy noted. 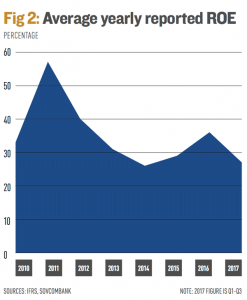 Given the precarious economic landscape after 2008, a number of foreign banks have gradually reduced their investments in Russia. According to outlets in the Russian media, the total loss amounts to around $2bn. Against this complex backdrop, another momentous shift has been underway. Indeed, the past five years have been nothing short of decisive for Russia’s financial sector. Under the leadership of Elvira Nabiullina, who was appointed as the new head of the CBR midway through 2013, a large-scale and unprecedented clean-up of the industry has taken place. When Nabiullina took to the helm of the CBR, she was faced with an ailing and bloated banking sector. In the 2000s, a booming oil sector helped mask the problems facing Russia’s banks, but the 2008 crisis swiftly brought them to the surface. Of greatest concern were deficient regulations, the prevalence of bad loans and a lack of capital. Fortunately, under Nabiullina, the CBR has deepened oversight in the sector by enforcing more robust liquidity and capital adequacy requirements. In the early stages of the initiative, the CBR focused on curtailing suspicious capital outflows, under the belief that billions upon billions have left the country, and purging so-called ‘pocket banks’. The post-soviet term refers to institutions created by industrial groups to service their businesses’ financial needs; in some cases they also acted as fronts for money laundering. The CBR took on banks that were previously considered untouchable, gradually tightening rules along the way, including those related to lending to the banks’ owners. Five years later, Russia’s clean-up of its banks is more than half complete: from more than 900 banks in 2013, around 500 are left today. While some have collapsed, others were bailed out by the state. The biggest among these were B&N Bank, Otkritie, and Promsvyazbank, which were all seized by the CBR in 2017. Meanwhile, since mid-2017, only financial institutions with strong ratings from Russian ratings agencies ACRA and Expert RA have been entitled to state funds and instruments. Another new rule – though only for the interim – involves meeting capital requirements and having balance sheets of a certain size in order to access state funds. The CBR’s robust work is lauded for having prevented another financial crisis, while helping to strengthen healthy banks in its wake. “Sovcombank is one of the beneficiaries of this process, because we were always suffering from the competition of organisations that never really bothered to stick to the rules, as well as those that were under-capitalised and managed to grow without a real capital base,” said Khotimskiy. The future for Russia’s banking sector looks promising – an outlook that is strengthened further by its impressive adoption of cutting-edge financial technology. Unlike other markets, however, this drive is not led by fintech players: according to Gusev, it actually comes from the banks themselves. Speaking about some of the most exciting technology the market has to offer, Gusev was clear about what stands out for him at present: remote biometric identification (RBI) and Russia’s Unified Biometric System (UBS). Sovcombank was one of the first credit institutions in Russia that began to gather the biometric data of its customers and transfer them to the UBS. “Of course, we can’t say that the system is working flawlessly at present, or that there are no problems with data transmission, but this can be expected because the process is still in its very early stages,” said Gusev. As the industry hangs on the cusp of this new future, some retrospection is important. Undoubtedly, a great deal has happened in Russia’s financial sector over the past decade – the last five years, especially so. This transformation can be attributed to a variety of factors, from a series of drastic external shocks to a dramatic clean-up of the industry. As the CBR’s initiative continues, more robust regulations will be implemented, while the unhealthiest banks will be removed from the landscape. Interestingly, this is not the only ongoing factor at play: the industry is being shaped further by new technology and the new opportunities that it presents. Sovcombank is well positioned to capture both. As demonstrated by its track record, the bank rarely fails to notice the opportunities that can be found, even in the most difficult of circumstances. All the while, it stays ahead of the curve, never resting on its laurels, working countercyclically and adopting the latest innovations in the industry to stay profitable, while remaining a key partner to its clients, both big and small. Russia’s financial industry has faced an incredible onslaught of challenges in recent years, but out of the clouds of doubt, the likes of Sovcombank continue to shine through.